When a couple moves in together, especially when it’s the first time for both, and around the holidays no less, the tendency is to spread joy to the world. The world doesn’t care though. These dramatic life events — love, marriage, babies — are actually very normal things experienced by unremarkable people every day. 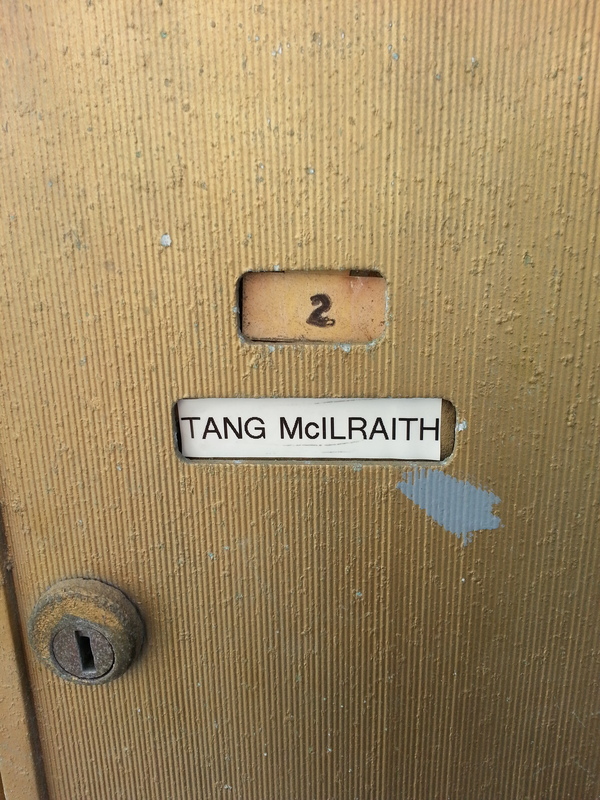 Our straitlaced yet endearing elderly landlord wasted no time in updating the mailbox with our names. Apparently he recognized that I come from a historically male-dominated culture and felt tradition should trump alphabetical order. Seeing the juxtaposition of our names lays out the essence of this joint venture explicitly. I officially, by virtue of a legally binding agreement, have a new teammate in all matters pertaining to life. In gaining this companion, I feel a poignant loss. Part of me died while signing that 13-month lease. I got this vaguely familiar sensation of my whole body trembling and losing the ability to grip anything in my hands. This is how I sometimes react to extreme anxiety. I struggle to remember the last time it happened before this. It might have been age 15, when the pretty nurse asked about the purpose of my appointment. After an awkward pause, my dad answered sheepishly that I wanted to get circumcised. For an insecure teenager, this little exchange was a bit much to handle. Now double that age, I must weather a similar level of angst while losing another part of me. Just like my foreskin, the fact that it’s technically expendable does not make it any easier to let go. In this case, I am burying the belief that I was different. Perhaps I have an overly rigid view of sharing living quarters with a romantic interest, but to me, this is the first significant step in a linear progression: engagement, wedding, reproduction, death. All great things or at least neutral, yet this path represents a concession. I thought I was special, but I am decidedly normal. I used to abhor the idea of a 9-to-5 job. But in journeying from sportswriting to startup to something in between, I have to be honest with myself. I like routine. I like compartmentalizing work and life. I like health insurance and looking forward to weekends. To give up my cocoon of an existence to start a company or challenge myself on a vulnerable path, I would need to find a true passion. And thus far the only passion I have found when it comes to careers is maximizing the ratio of salary to effort required. I used to think raising children offered little return on investment. I felt an overwhelming sense of freedom not having them, and just as important, not planning to ever have them. Everyone else was a sucker in my mind. And what did I do with this vast freedom? I fell for a kindergarten teacher who wants three kids and a dog. It’s like God directed me to stand on a pedestal just so he could take a dump on my face. I used to think the key to happiness was isolating emotions and focusing on rational assessments of value. I felt invincible with an internal source of satisfaction independent of interactions and relationships. Now I find there is actually someone I look forward to seeing at the end of every day, besides myself in the mirror if I am slightly dehydrated and can find the correct lighting to accentuate abdominal definition. The point is I envisioned doing something memorable with my existence, maybe leaving behind a body of work that was halfway interesting. But I lack that fire, that drive, the balls and initiative to just go for it and crush it. There is nothing wrong with this shortcoming. It’s simply normal, the baseline that puts into perspective how exceptional those who rise above the rest really are. All I can do is accept and embrace my identity. Because when a normal guy tries to be original just for the sake of being original, he ends up sounding like a Matthew McConaughey monologue in a Lincoln commercial. Sometimes you’ve got to go back to actually move forward. Matty, do you mean reversing out of a parking spot? Why is your shirt still on? The way I see it, I am moving forward to something exciting, but it will always sting a bit to look back on what I once found exciting.